Join Travac as we travel to magical Kenya and experience for yourself one of the most incredible natural phenomena in the world! Noted as one of the “Seven New Wonders of the World” and the “World Cup of Wildlife” if your bucket list includes a safari this indescribable MIGRATION safari is a MUST! During the migration season, up to two million wildebeest, zebras and gazelles will cross from the Serengeti, Tanzania to the Maasai Mara, Kenya during a 600km journey that has been repeated for countless decades. Travac has crafted a tour that will take you to Masa Mari National Park. This, the smallest of the national parks, gives you a better opportunity to experience the magnitude and sheer beauty of the migration. It is a once in a lifetime opportunity. Only 12 seats are available. Early booking is therefore essential if you would like to be part of the group. JAMBO – KARIBU!! Warmly met upon arrival at the airport. Transfer to your hotel in Nairobi, Kenya’s colourful capital city to check in to your city hotel. Welcome dinner is included this evening. After breakfast we are met by our local guide/driver for a city excursion. We will visit the giraffe center, elephant orphanage, and Karen Blixen museum, lunch at the Karen Blixen restaurant, later back to you hotel for overnight. Drive via Narok to the Maasai Mara National Reserve offering wonderful scenery and plenty of game. It is perhaps the only region left in Kenya where the visitor may see animals in the same super-abundance as existed a century ago. Arrive for lunch at your lodge. Enjoy an afternoon game viewing drive in this vast and expansive reserve teaming with game. Be on the look-out for the ‘big five’ Mara is famous for and the most sought after in the early 20th century when Kenya was a hunters’ paradise. Killing any of them game one some class, pride, heroism. These include the lion, Cape buffalo, the savannah elephant, black rhino and the elusive leopard. The vast savannah grasslands stretch as far as the eye can see is home to impalas, maasai giraffes, waterbucks, warthogs, Thompson & grants gazelles, topis, resident wildbeestes among many others. Later in the evening return for dinner and overnight at your lodge. Enjoy breakfast then proceed on a full day of game viewing drives & adventure. Be on the look-out for the big five that Maasai Mara is famous for. These include the lion, savannah (African) elephant, the Cape buffalo, the leopard and the black rhino. We may even be so lucky to witness a leopard or a cheetah sprint and make a kill! We return back to the camp for dinner and overnight. OPTIONAL ACTIVITY: Balloon Safari over the Mara plains followed by a champagne breakfast or visit a traditional Masai Manyatta (off the beaten track) and experience the culture of this world famous community. The Masai still live as they did for centuries -interact with these nomadic people and experience their way of life as you learn about their customs and traditions. Amka! Wake up early with coffee/tea and head off on your last trail of the African savannah – hopefully, you’ll see some big game. Return to the Camp for breakfast. After a leisurely breakfast we will be transferred to the airstrip for flight to Wilson airport. On arrival met and transferred to Jomo Kenyatta International Airport for your onward flight. Notes: The path of the Migration is dictated by rain – if rain is late, early or falls in different areas, the wildebeest will move accordingly. 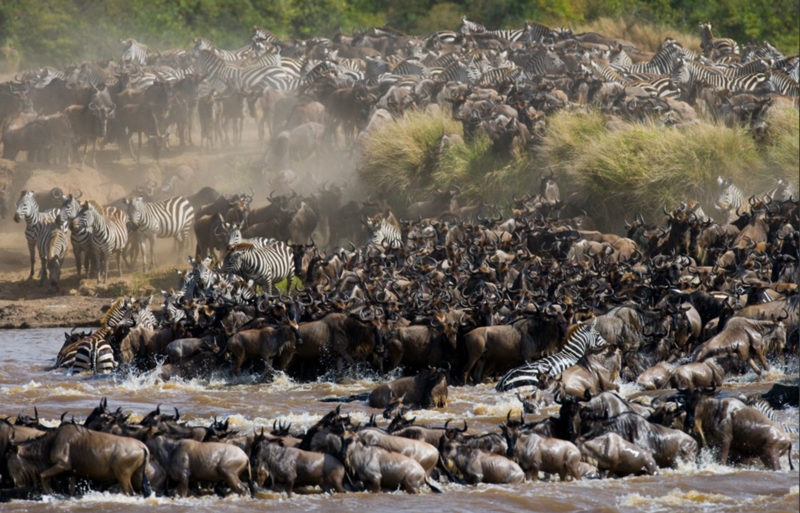 Migration into the Maasai Mara runs from July to October. Also note that river crossings do not occur instantly on arrival at the water’s edge. The herd may wait on the shore for a few days before crossing. We do have 4 nights in our game reserve and a total of 8 drives. The Sarova Stanley is a luxurious 5-star hotel set in a prime location in the centre of Nairobi. Hotel Facilities: Meal options at The Sarova Stanley include a restaurant. A delicious complimentary breakfast is served daily. Room service is offered for guest convenience. Our hotel provides a 24-hour front desk service. A currency exchange facility is also at your disposal. Public areas of The Sarova Stanley are comfortable and air-conditioned. Hotel guests will appreciate the services of a doorman. Additional hotel facilities: gift shop/newsstand. Leisure amenities: The hotel offers an outdoor heated swimming pool. Guests can also enjoy the following spa/wellness facilities: sauna, steam room, on site spa services. Use of a custom designed pop-up roof Safari Land Cruiser while on safari.